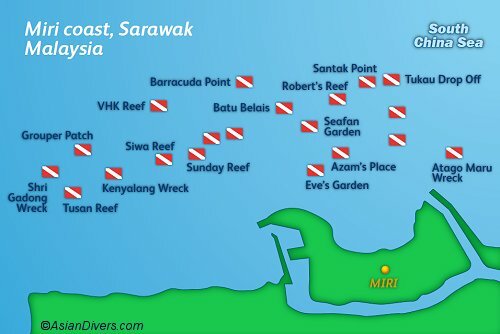 Famous for its reefs and wrecks, Miri is a diving paradise with about 30 dive sites. The untouched reefs of Miri in Sarawak have grown to be a well known place among serious divers because most of its sites have just been recently explored and are lying in shallow warm water boosting with impressive colorful reefs and marine life. Visibility can be found at its very best from Mar-Sep and you may anticipate seeing a lot of muck in addition to greater pelagics including groupers, most of which have made the WWII wrecks their residence. Accessible ony from Miri airport, the UNESCO World Heritage Site of Mulu is known for its limestone landscape featuring the biggest cave chamber in Asia. The jungle is where one can find a fantastic biodiversity of plants and wildlife such as wild orchids, rattan, pitcher plants most of them endemics. Birds such as Hornbills can be seen flying above the canopy.